Why Does My Computer Crash at Random Times? - Ask Leo! Why Does My Computer Crash at Random Times? Random crashes are annoying and difficult to diagnose. I'll review common causes and steps you can take to determine what's happening on your computer. My PC is not quite a year old yet but it recently started to crash, even while just running Word. Antivirus (both) check everything in order. What could possibly be the matter here? A “crash”, for the purposes of this discussion, includes things like random blue screens, random reboots, freezing up and just randomly shutting down or going to a completely black screen without warning. I actually have several articles on crashing randomly, but because this is such a common scenario I want to update my approach a little. In particular, I find one cause to be the most common. I’ll look at that, and then review what else might be going on. The most common cause of truly random crashes is an overheating computer. The most common cause of an overheating computer is blocked airflow through the computer, followed by a failing or failed fan. You probably know that there are fans in your computer whose job it is to move cooler air throughout so as to cool down the components therein. Your computer’s processor, hard disk and other components all generate heat, and if that heat is not somehow dispersed, the components themselves become too hot, function improperly, and cause a crash. Particularly when it comes to laptops, it’s very easy to accidentally block the air vents that allow air to flow properly through the device. I actually recommend never putting a laptop on your lap: use a table or “laptop desk” type device that ensures proper airflow. Desktop computers are more vulnerable to dust and pet hair which can clog the air vents. It’s worth unplugging your computer and looking inside. Carefully clean it out if you find large quantities of dust and dirt in there. Fans do fail. Fans have actually become slightly more complex over the years – in a effort to reduce the noise generated by your computer fans are now often variable speed – running quietly at a slow speed when your computer is relatively cool, and speeding up to move more cool air through more quickly as the computer heats up. The temperature inside your computer can change depending on what you’re using it for. The harder the computer’s processor or CPU works, the more heat it generates. That’s actually what makes those variable speed fans make sense – if your computer is mostly idling then it’s quite likely you don’t need the fans to run full speed. On the other hand, if the CPU is working hard, then as the internal temperature rises the fans will speed up to cool things back down. Listen to, or watch your computers fans as you use your computer. If they never turn on then there’s almost certainly a problem with the fan or its control circuitry. To be clear: your computer should be designed to be able to handle the maximum heat the CPU can generate. Even if your CPU is pegged at 100% usage in Task Manager, the fans should keep up. A machine that starts crashing randomly the longer it is used, or the harder its CPU is put to work is giving you a warning that something about the cooling system isn’t working properly. Check for overheating first. After that it gets more difficult. I used to mention malware early in the discussion about random crashes, but these days malware is much more interested in keeping your machine running so that it can do whatever malicious deed malware does. Certainly look for malware, but it’s less commonly a cause of random crashes than it once was. Failure is always an option. Specifically hardware can fail. We commonly think of hardware failure as being instant, total and catastrophic, but in fact there are various components that can have intermittent failures, or whose failures can have a delayed or random effect. Next to the fan, which we’ve already discussed, bad or failing RAM is by far the most common hardware-related cause of random crashes. Programs don’t always get loaded into the exact same place in memory, and that means that you might sometimes access bad RAM immediately, causing a crash, and other times it might take a while. Software tends to be what people think about first, but in fact with current Windows versions the vast majority of software errors will not result in your computer actually crashing entirely. More commonly, a program will crash or terminate unexpectedly, but Windows itself will keep on running. The exception to this is device drivers. Device drivers often operate at a low level where a bug or other unexpected error could cause the driver to fail in such a way that the entire system would crash. In particular, if you’ve recently added hardware to your system that involved some additional drivers being installed, or if a recent update included device driver software, then it belongs on the short list of suspects potentially causing your random crashes. The hard disk is a bit of hardware that deserves special mention, because it can mess up the software. If your hard disk, for example, has bad or damaged information on it (bad sectors, for example), and that damaged information happens to affect a part of Windows, or a device driver or something else, then when your system attempts to use that bad information a crash might result. Typically, you’ll get signs that this is coming: significant slowdowns in disk access, or even “bad sector” or “crc” warnings, before the crash. Make sure your computer has unrestricted airflow. Make sure your computer is free of dirt and dust, and that the fans are all working properly. Run a memory diagnostic such as Memtest86. Run a hard disk diagnostic such as SpinRite. Make sure that the operating system and all device drivers are as up-to-date as possible. Make sure that anti-virus and anti-spyware utilities are running and up-to-date. And as always, if the crashing behavior started after a recent change, consider reverting to a system backup taken prior to that change to see if perhaps that change was the reason. Why does my computer crash when I try to back up? 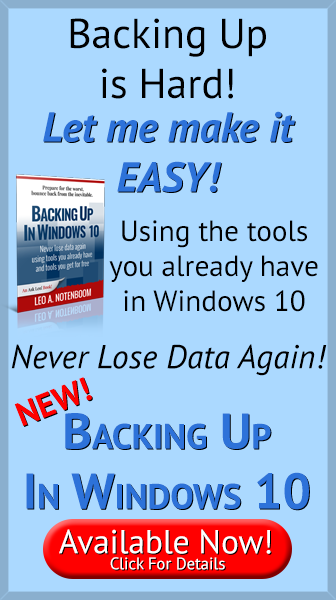 - Backing up shouldn't crash a computer, and neither should attaching a hard disk. How can I make a computer “Crash Proof?” - Do I have to say it? The only crash-proof technology is a good and recent backup! My Computer Has Started to Shut Down Randomly. Could it Be the Fan? - Airflow through your computer is an important part of keeping it cool and running well. Dust and dirt often block fans. Why is my computer’s fan coming on? - You've checked for dust, but the computer is still running hot. I'll point you in the direction of a few more things that could be causing this heat wave... including a heat wave itself. « Previous post: Is USB safe? I have a Compaq Presario laptop that also shuts down (drops dead, actually) when it gets overheated. The two fans still work, though. I finally got one of the new laptop chill pads, which has two fans that pull air through the bottom and blow it out the sides. It connects to my laptop USB port, so it can be a nuisance when I need to use the port that is not connected to my printer. The chill pad maker should have installed a USB hub in the pad so I could use a flash drive when I need to do so. I had similar problems during a hot spell over here in Scotland. As well as cleaning the fans etc, I realised that most of the ventilation holes on the side-cover of the traditional tower-type PC were being blocked by the PC being pushed hard against a room wall. To avoid this happening, I have “velcro’d” [hook & loop] two short lengths of 1 inch-square [25mm/2.5cm] wood to the outer face of the affected cover. These ensure that there is clearance space for air flow through those ventilation holes. Remember to clean the holes as well. During that hot spell, I noted that the Mains Voltage, nominally 230 Volts -6% +10% so supposedly 253 Volts max, was actually exceeding 260 Volts occasionally and almost consistently above 255 Volts. So an external regulator may be of use as well. Leo, you mentioned software usually doesnt shut down the whole PC. This was my previous notion as well. Just recently though, I acquired some malware from the torrents. I cleaned it out but I can tell its still there because my first Google result always gets redirected to infomash or something similar. Thats not the issue though. My issue is that whenever I run uTorrent on my PC, it will inevitably crash within less than 2 hours. It won’t crash immediately but after a little while boom. BSOD. I know I had a slightly faulty wireless card, but any other networking program should shut it down as well. The problem occurs ONLY when im downloading and/or uploading torrents. I can’t figure it out, what do you think it is? Piriform has a great little free program called “Speccy.” For newer machines it gives you everything you need to know about your PC and let’s you save the results for later reference. It will give you temperatures of the CPU, the system, the memory, the hard disks, and all kinds of other information like the speed of the fans, etc. You might be surprised to learn that your memory is not running at the correct speed. By keeping snapshots you can see if the temperature is increasing. If it is, it’s time to open up the case and blow it out with canned, static free air. Do it outside or you’ll be sorry. Don’t use a vacuum to blow it out as this can cause a static buildup that can shock your machine, I know. I recently found that a memory card in an old laptop was not as fast as it should have been. The vendor I’ve bought memory from for years has a lifetime warranty and they have kept records of my purchases for the last 20 years. They replaced the memory card on this 7-year-old computer. It pays to shop with quality vendors! Piriform also produces the highly regarded free CCleaner utility for getting rid of those pesky invalid references in the registry and helps to manage your startup folder and other things. AnVir software has a free version that monitors your startup configuration and warns you at the next boot if something has changed, like Adobe updater, etc. It keeps you from having all the surprising clutter being added to your machine without your knowledge, which slows it down. Related to heat issues is loose components. Although it is not the problem it used to be in the dinosaur days, heating and cooling cycles can sometimes loosen chips and components. So, for an intermittent problem it is worth removing and reseating various components, or at least pressing on things to ensure they are completely seated. When cleaning interior, don’t forget to clean the fans on the Power Supply and on the Video card. I have been preaching the use of canned air in removing dust to no avail, for years. Until their systems break, most people will not change. I wish somebody will invent a 400 psi hand(No electricity) refillable air pump. I glued a straw to an empty garden sprayer for 100 PSI air. It was never filled with chemicals. It is better than Re-Air. A poor hard drive connection can cause crashes, and is especially frustrating and hard to identify, if the connection is good most of the time but fails now and then. awesome work leo – and i’m boosting my own ego saying that. i’ve seen this behaviour a few times, blue screen (BSOD) etc,open the case to find the CPU heat sink loaded with dust. So often we techs go for the most difficult solution first only to find all you need is an air compressor and ear plugs. i tend to take the step of reseating and regooping the CPU when i’m in there. but bottom line everything you said is right on.!. System is XP, fully up to date, AVG. Nothing adventurous for applications. With typically Google calendar or other functions up, plus Thunderbird. System locks up. No keyboard response. Cursor is stuck, no mouse response. Power down and reload is resolving this for now, but….but….but….bad news is coming I fear. Thanks for the column and advice. This. I had a problem with my computer randomly shutting off a year or two ago. It was getting worse and worse. I just had to look inside and dust off the fan, and it worked good as new. A year old and still running XP??? Proper power supply voltages are often overlooked, can cause a multitude of issues, and can be intermittent until complete failure. Having worked as a tech in a computer shop, I have seen plenty. Have your computer tech check this or find software that will monitor. Leo, it would be a good idea to recommend to people experiencing random crashing that they run the System File Checker as well. Many times I have found that when the system files get cleaned up such troubles go away. You should advise them to insert their Windows disk first (as it will invariably be requested later if one doesn’t start with it in), then choose Windows-R and in the run box, type “sfc /scannow” (without the quotes). This could just be one more line of investigation for random crashing. Thank you Leo, I am not computer savvy, but I shall have the tech look at my pc. From your answer my guess would be the fans. Thank you again. Thanks for the article & comments. I’ve done, or are about to do all of the items on the “checklist”, but have a question about drivers. Is there an easy way to tell if/which need to be updated? I look for updated drivers if I suspect that they are somehow involved in the issue, by virtue of their device being at fault or other clues. How, and when, should I update drivers? You missed one that is I’ve had on my own machine and helped others with on theirs. An overloaded hard drive. Windows needs to have a good chunk of hard drive in order to function properly, and Windows doesn’t tell you when it is low on space. It just keeps on going and running programs and just crashes, and the reason is not obvious and the crash symptoms can vary. One good diagnostic tool is the sound your computer makes when it starts up. All the desktops, and most of the laptops I have owned, you can hear the fan come on at high speed when you turn the computer on…and most of them will do so also when just restarting the computer. The fan will most generally quiet down a couple of seconds after booting the machine, when the BIOS gets to the point in the boot instructions where it checks temperature and resets the fan speed. (I surmise from this that the fan speed defaults to HIGH.) So, once you recognize the fan noise, you can use the presence of the noise before shutdown to recognize there may be overheating involved, or the lack of the fan noise altogether may mean a failure or loose connection in the fan. I try to make a point of opening my computers up once a year to blow out any dust that has accumulated. People with pets that shed may need to this more often. And a note about laptops….you will most likely want to blow air through the cooling channels BACKWARDS, because the heat sinks have narrow passages that often clog up. Blowing through the fan side will tend to force those dust bunnies/hair balls further into the heat sink; blowing from the exit side will tend to send it back out through the uptake opening. A clue from the question itself: “Antivirus (both)…” I’ve experienced all kinds of weird behavior including BSODs when I’ve (inadvertently) had two antivirus applications installed (true antivirus, not anti-spyware or other anti-malware). The dueling applications each think the other is a virus (due to the way antivirus applications work) and beat up on each other trying to wrest control of the system away from the “intruder”. Best practice is to have only one true antivirus application installed and, if you suspect an infection that went undetected by your installed antivirus, run one of the free on-line antivirus scanners. That’s true, but instead of true antivirus, it’s more correct to say more than one antivirus programs scanning in real time. There’s no problem in having more than one AV as long as only one is scanning in real time. My Asus laptop shuts down suddenly after 5-15 minutes if I run it with the cover shut, during heavy number crunching or when feeding Internet content to the TV. Maybe it breathes through its keyboard, or maybe the screen puts out heat even when not in use. Leaving the cover open is untidy, but avoids the problem. Yes. Laptops are actually designed to run with the lid open. That’s why they usually come with a default setting of going to sleep or shutting down when the lid is shut. Heat is so damaging to computers that it seems best to just keep the lid open when running it. 1) Identify where the air comes in and where it goes out. Most laptops get the air in through intakes on the bottom of the computer, and blow it out one side or the other. 2) Turn off the laptop and remove all cables. 3) Remove the covers on the bottom of the laptop. 4) Pick up the lap top and put your mouth over the exhaust port and blow as hard as you can. You may be amazed at how much dust comes out the bottom of the computer. Blow a few times more, then reassemble your laptop and resume normal use. Understand that this is not a complete cleaning, but on the other hand it does not mean a trip to the shop or extensive dissassembly. I was wondering what the correct way to do this was. I have no problem opening up the case of my desktop to clean dust. But wasn’t sure about what to do with the laptop. But I’ve been thinking it probably needs some cleaning, as I notice the fan running at a higher speed more frequently than it used to even though my computing habits have not changed. Excellent article, Leo. It should be mentioned that, in desktop computers, the number 1 location for dust to accumulate in a way that will cause overheating is at the CPU itself, under the CPU fan. Inexperienced users might not see this dirt unless they are looking for it specifically. Dirt will often accumulate over the fins of the CPU heat sink until airflow is completely blocked. It is best to blow out this dirt with a can of compressed air (purchase from an office supply store or computer retailer) rather than trying to use a vacuum cleaner. Users should be sure to unplug the desktop before opening the case. I find that a year or two of normal use is usually long enough to require cleaning of this area. Thanks for all your great comments here. * CPU overheating can show intermittent symptoms but usually the entire machine simply clicks off in an instant. * Check bad RAM. Boot Memtest86+ from a CD. Run a complete pass, all tests. If you see any errors at all, replace your RAM. 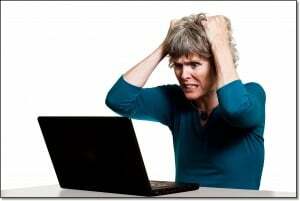 * Uninstall all your anti-virus and anti-malware temporarily and see if the problem goes away. Afterwards reinstall only 1 good anti-malware package. * Try the free HWMonitor utility from cpuid.com for real-time temperature measurement. fans, where possible, to avoid reverse-emf frying your mainboard. Thank you so much for this article. A PC with a crash problem was about to be taken to the repair shop. The article has been printed out and the listed points to fix the problem will be followed plus suggested software mentioned will be downloaded. i have same problem but when i installed it with kaspersky pure 3 and its gone. ive try bitdefender and avg , avast ,malwarebytes ,advance system care and malware IObit and still the same it crashed. before i always suspect my RAM and CPU and change the bios and it took me two years to figure out. My 3 month old Asus k553m Laptop with win 8.1 started crashing, screen would get jumbled the freeze. Customes support side to unplug power supply from laptop then hold power button down for 60 sec. then power up and then plug the power supply back in. It seemed to work but it is a PITA when it is happening at least 2x a day. He said the concern stems from static elect buildup on and in plastic case and that procedure will discharge the static. This sounds like it may also be some of the concerns in this thread as well…no? I was getting BSODs on my laptop. Managed to get the main error # of 109. It looked like many times it is caused by a faulty piece of RAM or bad software. The last crash was when I was attempting to change settings in Windows Media player. Maybe Windows was corrupted? I restored an image from about 6 weeks before the crashes started. Since I only had 2 x 2 MG of RAM, decided to replace one with 4 GB. I arbitrarily chose one chip to remove for the 4 GB replacement. Also changed out the 2nd to 4 GB a few days later. Memtest86 showed no errors when run through to completion. So far, no BSODs have occurred since then, over a week ago. I am not babying my laptop either. I wonder if static electricity could be causing our sudden shutdowns? Our new couch has a lot of static. I have no financial connection with this company or its free software. Great article, Leo, from a four-year reader. My Toshiba Satellite C655 just blew a fan (trust me, it was loud! ), so I ordered another one online and a friend of mine replaced it. While watching him literally take apart my laptop and put it back together again, I noticed there was no dust (I blow it out w/can of air from time to time), so guess it was just time for the fan to go! The new fan is much quieter than the original one, and I am sure happy to be back full-bore with my computer. Funny thing, when he opened up the laptop, there was this little round battery inside. He said it is for BIOS, and most people don’t even know it exists. Must say, I fall into that category. Next time I will replace it, too! Thanks again, Leo, for all the help you have provided me over the last four years or so. One more thing that can completely crash a computer is a bad video card. I upgraded a video card on my desktop computer and soon after installing the card the computer started crashing. I took the card back to the store and they tried it and it immediately crashed their computer. A replacement card has been in use ever since without trouble. I have bought a new custom pc aswell and it keeps crashing. It has an Amd fx 6300 prcssor and two 120 mm fansi has 8 gb and 1 terrabyte. My PC is about 15 years old, with some modifications made to it. It runs the Windows 10 OS, but used to run Windows 7, and originally ran Windows XP. When I made some modifications to it to run Windows 7, it started crashing. I then decided to upgrade it to Windows 10, hopefully to see if it will stop crashing. But unfortunately, it keeps crashing. It’s not overheating for sure, but I don’t know what it is. Any advice? It’s not possible to determine that without some testing. My experience with older computers is that they often just seem to wear out. Maybe some hardware component is no longer working consistently, or some driver doesn’t work correctly on such old hardware. When I experience that, I replace the computer and recycle it. You might be able to get it working, but you have to decide if it’s worth the effort. I had a friend with an old computer which was behaving as you described. The amount of work I put into it for him would have more than purchased him a new computer if I charged him the going rate. It could be any of those things. I’m not sure what you mean by “heavy program”. My computer has been crashing since I got it, It used to be the blue screen of death (finally fixed that) but now I have something equally bad… RANDOMLY (sometimes not for a week, sometimes 10 times a day) it will simply freeze and I have to unplug and re plug for it to turn back on. I know it’s not overheating because it crashes equally in different tempatures (basement/top floor, Summer/Winter) and although the ram was corrupt, that’s fixed (and tested by NCIX). It’s not the operating system, both 8 and 10 crash for me. Also the freezes don’t occur because of overuse of the pc, they can happen when I’m reading a page on google, or when my pc’s going 100% for minecraft. One thing I know is that it will only crash at my house (most likely) because it was stress tested at NCIX and they didn’t get a single crash. I suspect there might be some problem with energy surges or lack of energy. During really short power outs my dads setup will stay on, 1 of my monitors will, but my pc turns off or freezes immediately. Is it possibly some kind of capacitor issue? Or even maybe when my dad turns on his setup, that that brief extra use of energy might be enough to freeze my computer. I’m getting a power surge protector with the hope it might solve my problem. Any suggestions? If not I’m used to it, no sites seem to have a fix for this. Thank you for publishing your article, Leo, which despite the only possible date thereof being a statement that it was published on August 3, 2014 in Hardware magazine dates back at least to 2010 because the Comments to it do. Please update some of the references or links in it. Based on your suggestion, I jsut downloaded RalTemp 3.7 for use to gauge the temperature of my CPU and discovered first that it was not even compatible with Windows 10 and second that it was not compatible with my AMD A4-5000 APU with Radeon (TM) HD Graphics. I am having to try to uninstall it, but it has no uninstall utility built in to it so I am apparently going to have to download some uninstall program because RealTemp doesn’t even register in my Settings as an App that I can uninstall through Settings! i have to ask–have you ever encountered a system which freezes up such that the monitor looks like it has had water poured all over it, the pixels are all smudged across the screen so that it also looks similar to old pre-cable TV screens when they would go haywire? My HP has been having those kind of crashes since I bought it, in response to which the ONLY thing I can do is hard boot, hold the power button down until the computer shuts off, then wait 30 seconds, then turn it back on. Sound s suspiciously like the blue screen of death, doesn’t it? Despite it’s being dated, your article is still helping me identify why my system is throwing an entire barrage of Windows-imposed with error message, pixel-smudged, solid-freeze, and system shut-down crashes at me to the tune of 5-6 per day now., although any additional insight would be greatly appreciated.